When I was first married I met a great group of women in a club called Patte Kake. 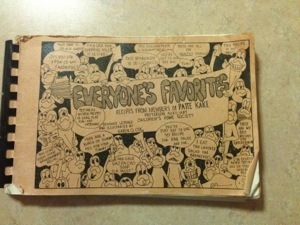 Patte Kake was an auxillary of the Children’s Home Society of California. I had known quite a few of the women in the group, some from childhood, but a few of the others were new brides that had moved into the area. We were all in our 20’s and 30’s and used to meet at a different members house every month. We always had beverages and desserts, some fancier than others but always homemade. Most of the women where either married to farmers or their spouse was connected in some way to agriculture. Some of the women I met in this group are still my dearest friends and I love them like sisters. One of the fundraisers we had for Patte Kake was a cookbook that was made up of recipes from the members past and present. It was a wonderful little book and after 35 years the one I have is well worn. You can always tell the most used recipes in a cookbook, they are the ones with stains on the pages or the ones where the book opens up to the most used page. 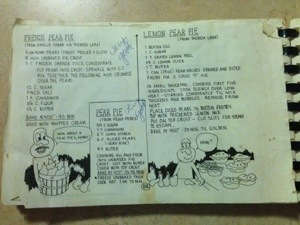 Pear Pie Recipes, definitely a used page..notice all the stains! Theresa was a childhood friend that invited me to join Patte Kake. 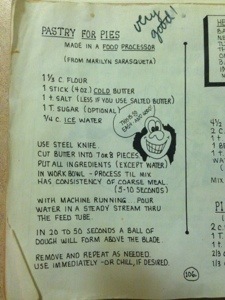 Theresa was a fabulous cook. Whatever came out of Theresa’s kitchen was always delicious. I first had this French Pear Pie at Theresa’s house. I usually don’t like fruit pies, but I love this one. It was originally from Theresa’s Aunt Amelia another fabulous cook! 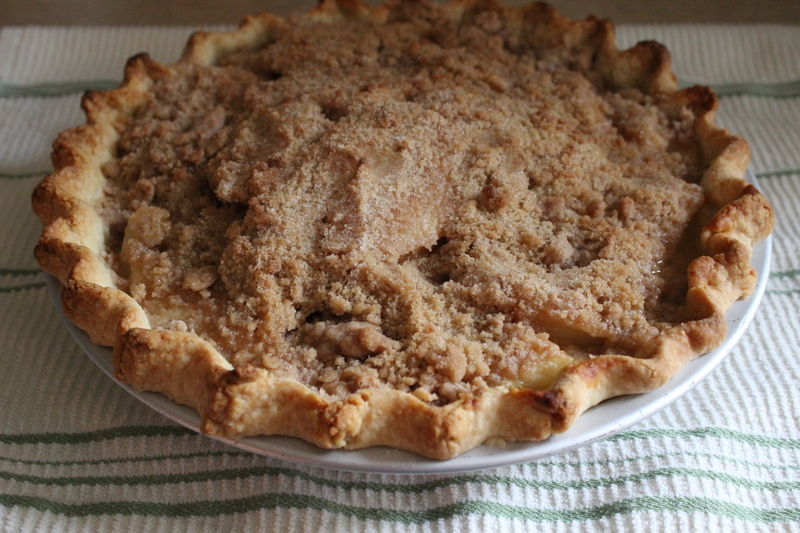 My neighbor brought over a bag of fresh pears yesterday and it made me think of Theresa and her pear pie. I haven’t made the pie since Theresa passed away and when I made the pie today my husband said it was the best one I have ever made. I think Theresa was a little angel on my shoulder guiding me today. 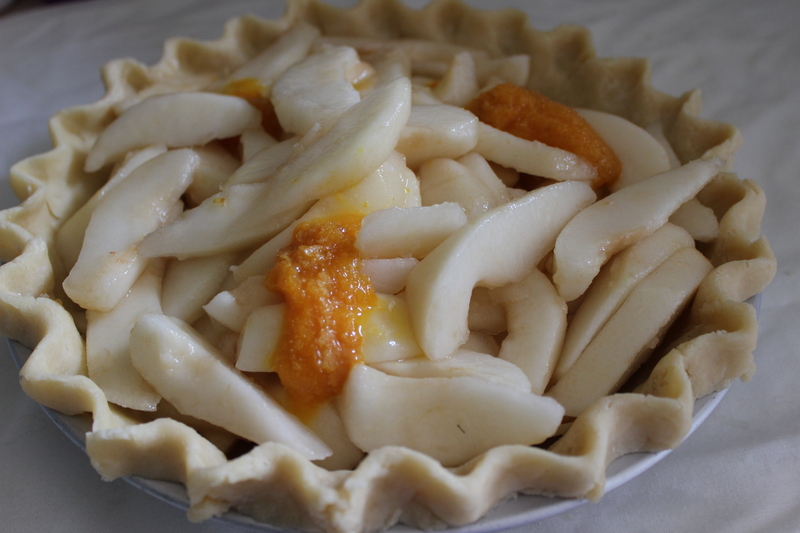 Put pears into crust-sprinkle with orange juice concentrate. Mix together the following and crumble over the pears. It’s great served with whipped cream! 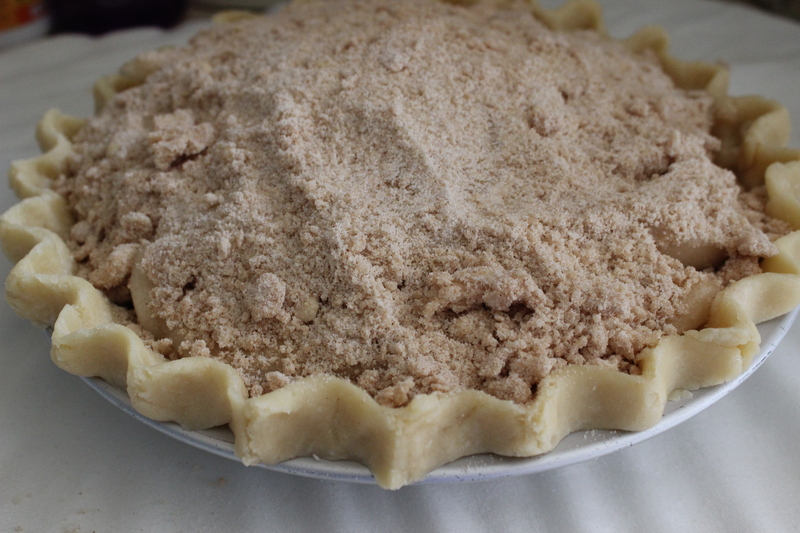 The pie crust I use is one that I have used since I got my Cuisinart food processor over 35 years ago. The recipe came from a booklet that was in the Cuisinart box. Use steel knife of food processor. Cut butter into 7 or 8 pieces. Put all ingredients (except water) in work bowl of processor. Process til mix has consistency of coarse meal. (5-10 seconds) In 20 to 50 seconds a ball of dough will form above the blade. Use immediately or chill, if desired.